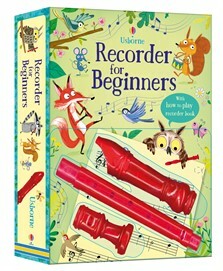 This attractive gift set contains a bright red recorder and a delightfully illustrated step-by-step instruction book. Children learning their first musical instrument can find out how to play their first notes and play more than a dozen tunes. They can listen to the tunes at the Usborne Quicklinks website to hear how they go. Learning to play the recorder is so easy! In this gift set, there is a red recorder kit and a super cute book. There are steps by steps so children can learn very fast. The book also contains 13 rhymes to practise. I think older children who want to learn a new musical instrument may love this too.